Time is both important and unimportant to a rider on cross-country. For an event rider, knowing speeds and time in your head can be the difference in mere seconds. At the lower levels, time is one of the least important parts of the round, as the rider should be trying to be in control and safe. At the top levels, time is of the utmost importance as it can mean moving up or down in placings. The good news is this is something that can be explained and taught. If a rider practices this enough, eventually they can develop a “clock in their head”. This will help them at all levels to maintain a consistent and safe speed while out competing. A simple lesson in speed and time can teach riders how to effectively manage their speed on cross-country. Some items you will need to practice this include; at least four to five cones, a stopwatch, a meter wheel, an extra person to run the stopwatch, and a lot of space. This is best done in a giant field or at a place where events are held and riders and horses can continue on a long straight stretch. It is best to do this exercise without jumps. A rider should have a good idea of optimum pace before they start adjusting to make up for time used to jump a combination of fences. Start by measuring out your distance using a meter wheel. Put a cone at what will be your starting point (making sure there is enough room before the cone for the horse and rider to get moving). Measure out on the metric wheel a distance of 300 meters (Beginner Novice goes that distance in a minute), put a cone at the end of that distance. Continue on straight to 350 meters (Novice goes this far in one minute). Next continue on to 450 meters (now you have gotten to the Training distance for one minute), and finally at 520 meters from the start, put your last cone. This is the distance a Preliminary horse and rider cover in one minute. This is when you put yourself to the test. The first cone is the starting point. 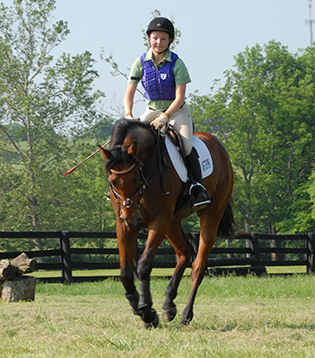 Try to get your horse moving at close to the speed you are trying to obtain as you pass that first cone. Your extra person will stand at a distance where they can see the first and last cone in the series so they can start and stop the stopwatch as you pass the first cone and then the cone you are riding to. It is important to know the speed of each of these levels. Start with the shortest distance. The speed of 300mpm (meters per minute) is for Beginner Novice Level. 300mpm is an easy canter. It is not super slow, but should not necessarily be “pushing” the horse. Once you have gone and had a chance to hear your time, go a second time and try to get closer, depending on how fast or slow you went the first time. It usually takes about 2-3 rounds for someone to get nearest to a minute. Each horse will be different in speed due to stride length and moments of suspension in the canter. Once you have mastered the Beginner Novice speed, you can go from the 1st cone to the 3rd cone for Novice, which is a bit faster at 350mpm, then 1st to 4th cone for Training at 450mpm. This is a pretty good increase in speed, so it’s ok to move a little faster. Finally, if you feel successful you can go from the 1st to 5th cone at Preliminary speed (520mpm) which is a gallop. It is good to practice this as many times as needed to help riders understand speed and timing. You can modify your training to putting cones every ____ meters and trying to get the same time over two or three minutes. 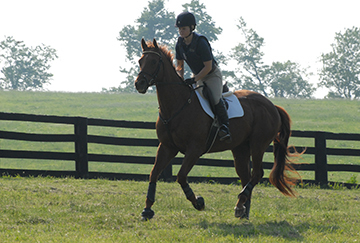 Once you have gained a good clock in your head, you can start to add jumps into the equation to help teach you how to maintain a good pace while being able to set up for fences, but not lose time.